Group exercise routines, dancing, Double Dutch teams, fitness contests, smiles and laughter accurately depicts what took place at the 2nd Annual Fit Fathers Day (FFD) celebration. Typical Father’s Day ideas consist of brunches or cookouts so the Fit Fathers team decided to shake things up a bit. We brought the celebration back to Veterans Plaza in Downtown Silver Spring, MD from 10 am to Noon, still leaving time for families to go along with their regularly scheduled plans. Fit Fathers, DaddysCool.com and Powerful Beyond Measure came together to show fathers the importance of being health conscious and leading by example through positive, nutritional choices. The Fit Fathers Foundation believes health, fitness and nutrition can help fathers live longer and challenges all dads to eat clean, stay active and continuously energize their lives! An energetic Social Workout was led by Fit Fathers’ founder Kimatni Rawlins, celebrity trainer Michael Bance and 12-year-old fitness guru Jodi Evans, while DJ Blinks mixed sounds behind a stellar Bose audio system to keep everyone entertained. A special 80s and 90s mix was put together for our Terminator Genisys movie workout. Movie posters, premiere tickets and t-shirts were given to the FFD attendees. Fitness contests, family workouts and activities, an inflatable obstacle course, healthy snacks, health screenings, gift bags and demonstrations gave this Father’s Day event something for everyone. Another highlight was the timed fitness course that crowned James Swink Mr. Fit Father 2015. He won four Yokohama tires as the grand prize. FFD is possible due to Mazda, Volkswagen, Children’s National, Wegmans, The Washington Auto Show, DC Capital Striders and City Sports. The event also highlighted the amazing work of our community and media partners including: African American Health Program, Street Wize Foundation, National Black Child Development Institute, LoveLife Foundation, 14th Legislative District (Montgomery County), Action for Healthy Kids, Aspire Sports Drink, Automotive Rhythms, Bance Fitness, Creative Edge PR, African American Health Program, Embrace Kids, Fathers Incorporated, Fit For Life, Greenbelt S.I.T.Y. 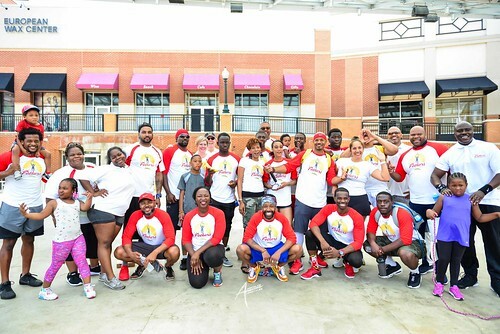 Stars, Healthyblackmen.org, Kids Being Fit, Physicians Committee for Responsible Medicine (Dr. Neal Barnard), Men’s Health Network, Mocha Moms, Kids Being Fit, Shoe City, SOULCYCLE, Strive 2 Tri, The Boot Camp Girl, Throttle Life, Vegan Pro, Meatless Monday, Montgomery County, MD Dept. of Police, Center for Nutrition Studies and Washington Sports Club. Also, NFL players Jason McCourty of the Tennessee Titans and Adrian Coxson of the Green Bay Packers, who attended the celebration, served as Fit Fathers’ National Ambassadors for the momentous occasion. We thanked attendees for supporting our cause with prizes and giveaways courtesy of Aspire Beverages Baltimore, City Sports, SOULCYCLE, Bose Audio, Under Armor, Shoe City and Mothers car care. Through social media and the use of the hashtag #FitFathersDay appearing across multiple newsfeeds, there is already an air of anticipation for Fit Fathers Day 2016. We greatly appreciate our sponsors and partners who recognized the vision and helped bring FFD to fruition. A very special thank you is in order for all the patrons and volunteers who attended and participated. Although Fit Fathers Day is a special occasion to recognize Dads during their time of celebration, our mission is to also become active with, Moms, kids and families throughout the year. Stay tuned for more Fit Fathers events as we move forward to engage with different communities around the country. Enjoy the photo gallery.